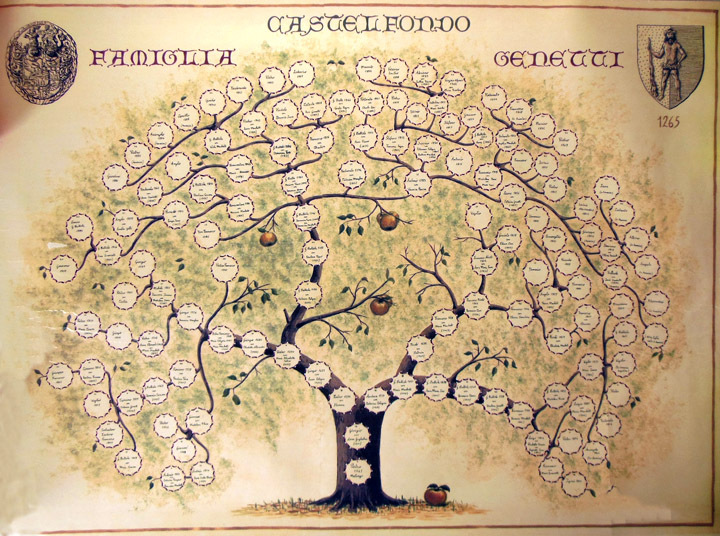 The Genetti Family tree showing male lines of the family dating back to 1461. A few weeks ago I received an email from Tom Genetti. His family had emigrated to Illinois around 1880 from Castelfondo, Austria. Tom was enjoying the new Genetti website, but did not find his family on the tree. He wanted to know what branch his ancestors had come from and if he was related to the Genetti family in Pennsylvania (my branch of the tree). Like most of us, Tom had grown up with various family stories, one being that he had cousins in Pennsylvania. Good questions that required research to find the answers. Since different branches of the Genetti family had emigrated to different parts of the United States (Pennsylvania, Wyoming, California, Illinois, Michigan, Utah) and, for the most part, we are all related, it was a matter of tracing his ancestry in the Castelfondo church records to find the closest common relative. Tom’s grandparents had Americanized their names, a common practice by many immigrants. This complicated the search because we needed his true name to continue. Since we knew his grandfather had lived and died in Illinois, it was easy to find details in the census and Illinois Death Index. That gave me a clue to his original baptismal name, plus his actual birth date and the name of his father. When I located Tom’s great-grandfather on the original tree (lower left branch of the tree shown above), I knew exactly what part of the family Tom was from and where to look in the records. It took about two weeks worth of digging to find the names and dates of his direct male ancestors. But they were all there. And guess what … yes, Tom was related to my branch of the Genetti tree. Matter-of-fact, he was related twice! It turns out that Tom’s great-grandparents were Cipriano Genetti and Catterina Genetti. They were distant cousins from two different branches of the tree. Catterina was first cousins with my great great-grandfather Leone. OK – here is where it gets really confusing! This would make Tom my 3rd cousin twice removed (through Catterina’s line) and my 7th cousin once removed (through Cipriano’s line) with our closest shared blood relative being Pietro Genetti born in 1650! Yes, I’m kind of a genealogy geek since I love figuring out family tree relationships. So far, I’ve located three marriages between distant cousins that have joined various branches. With Tom’s line completed, I have added 26 new names to the Genetti online tree. Beginning with Pietro Genetti (1650 to 1706) and descending to Tom’s father. There are many, many more branches of our tree to research and add. I’m sure my genealogy journeys through ancestral documents will keep me busy for years to come! ← What Is a Sopranome?